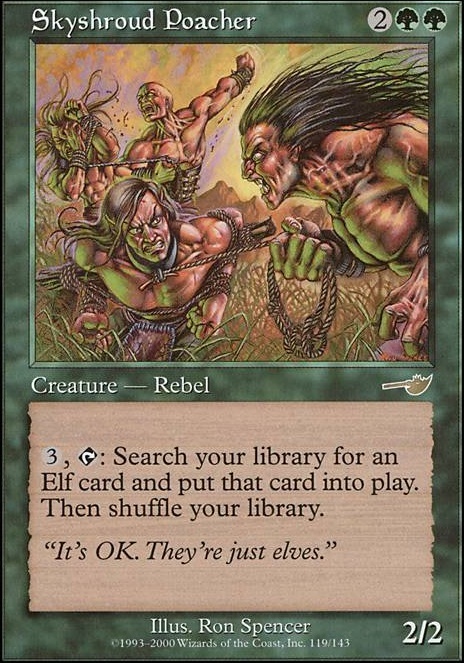 (3), Tap: Search your library for an Elf permanent card and put that card into play. Then shuffle your library. Nice deck. +1. With the amount of creatures you're running have you thought about using Paradox Engine and Beast Whisperer. You could also use Thousand-Year Elixir to get this running faster, especially with Yeva as your commander. These combo so well to get you pretty much playing all your creatures in everyones turns. 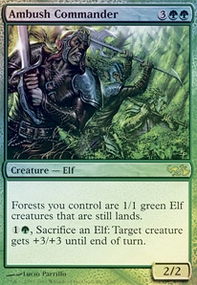 Also Skyshroud Poacher is such a powerful card in an elf deck. Feel free to have a look at mine Elf Rumble!!!. Would be cool to get some feedback too. I love that card, but Skyshroud Poacher ended up being far too slow. Anything that takes seven or more mana and doesn't basically win on the spot in this deck got cut. 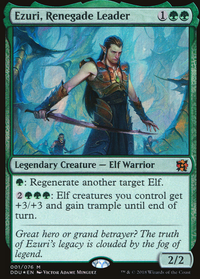 Now he could work real well, but i just found him, at 4 mana with no elf benefits, a wasted play except very late game (when i have haste and extra mana) which is were this deck should never be if possible. This wants to win turn 3 - 5. Suprised not to see any list really running Skyshroud Poacher. 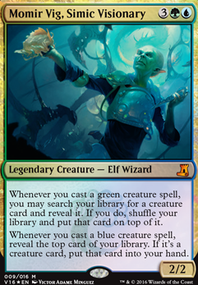 I can understand it being a Rebel makes things less synergistic but being able to put an elf into play from your Library for 3 is pretty solid for getting pieces of your combo. I'd recommend Skyshroud Poacher, tutor every turn for 3 mana, and put it onto the battlefield? Why not? For Revive and Gaea's Blessing, I have them in there to be able to get cards from my graveyard back into my hand effectively (Skyshroud Poacher is a nice tutor). With the added bonus of Gaea's Blessing being able to draw an extra card every time I play it. Primal Command is something I placed in there because it's a mix of both tutor and getting a creature back from my graveyard. I'm pretty sure I don't have many of these kinds of resurrection cards in my deck currently. 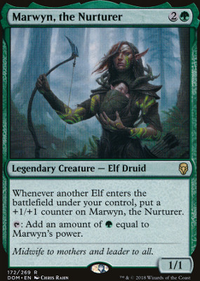 It's for when vital pieces such as Elvish Archdruid, Priest of Titania and Wirewood Channeler all get killed. I also feel like that the cost shouldn't be too much of an issue if I play it around turn 4 or 5 if my starting hand goes well. I agree with you on the other 5 cards. Gaea's Touch seems to be a redundancy as I already have Exploration. 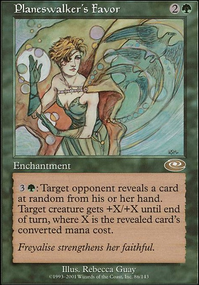 Selesnya Signet is a ramp card, which I don't need as if I _do _need it, something has already gone wrong. Natural State is just a bad Naturalize. Savage Summoning is something I put in there at my friend's recommendation. Someone in the playgroup is going to be running as Esper deck. Wilt-Leaf Liege I placed in there as I saw it was recommended on EDHrec. It would give all my tokens a +1/+1 and my legendaries a +2/+2, which I thought was pretty nice. A friend recommended I remove Huatli, Radiant Champion, Omnath, Locus of Mana, and Vitalize. He argued that Hautli is a slow card, and does not change the board state immediately. I do see what he means, as it would take 2 turns for him to actually do anything for me, as even if I used his -1 ability the instant I played him, that creature would just be blocked. Omnath was said to be redundant, as my mana dork deck was based around actually using that mana. I argued that it was just a plan B in case I didn't draw any of my other heavy cmc spells, but he argued again that it was a pretty bad plan B if the threat can be removed with a single removal spell. Vitalize he said was not worth a card. I fully disagree with him on that, as I figured that it would basically be giving me another turn instantly, as I would be able to use Rhys' abilities twice in a turn. I don't think he's played a token deck before, so I'd like another opinion on those cards as well.